Whatever you do and wherever your work–jerks are all around you. And without a clear strategy for working with these difficult people, we inevitably suffer and risk failure on the job and in our careers. Join us for this webinar, as the author, Eric Williamson, provides solutions about how to motivate and retain staff and continue getting the maximum productivity from them. To listen to the recording, follow this link. 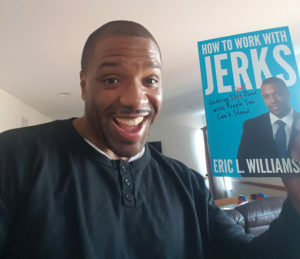 To order a copy of How to Work With Jerks, follow this link. Copyright 2018, Cathy Fyock LLC. Click here to sign up for a complimentary strategy session!